Tender, Swollen, Bleeding Gums? What You Need to Know! As children, missing a few teeth was considered cute. The prospect of money under your pillow from the tooth fairy even made losing a tooth exciting. It’s safe to say, as an adult, losing teeth is not something anyone looks forward to. If you knew you were putting yourself at risk of a toothless smile in the future, you’d want to do everything you could to prevent it, right? Brushing and flossing are very important to maintaining healthy teeth and gums. Very few people floss as often as needed to prevent bacteria from growing. It’s important to realize gingivitis can develop in as few as 24 hours! While excellent home care is the most important step to preventing gum disease, there are many risk factors. The American Academy of Periodontology (AAP) estimates approximately three out of four Americans suffer from some form of gum disease and only a very small percentage seek treatment. You can have gum disease with very few – sometimes no symptoms or pain at all – until it’s progressed to very advanced stages! 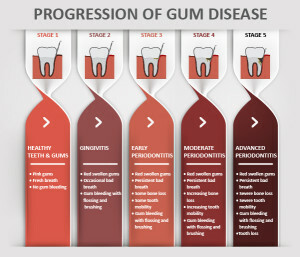 The only sure way to know if you have gum disease, what stage the disease may be, and to develop a plan of action to stop the progression and attempt to repair any damage that’s already been done is to have a comprehensive periodontal evaluation by a licensed dental professional. If you live or work in or around Savannah, Dr. Cooper can help. Even if it’s been years since you’ve had a dental exam, we can develop a plan to save or preserve your smile, before it’s too late. Your future self will thank you!